The Weihrauch factory is in Germany, and they make some of the finest spring-piston rifles available today. 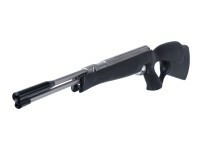 The HW97K is derived from the HW77K, and both air guns continue to be used by field target shooters. 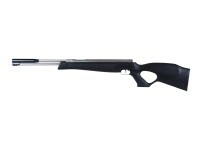 The HW97K air rifle has fine lines and is beautifully executed in stainless furniture, fitted with a synthetic stock. 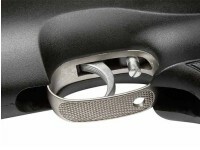 The thumbhole configuration is topped off with a rubber recoil pad. 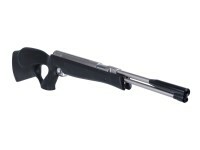 This airgun is totally ambidextrous, having raised cheekpieces on both sides of the buttstock. Your Beeman air rifle will deliver remarkable accuracy, repeatable/reliable power, decades of dependable performance, one of the finest sporting triggers ever made and flawless finishing. These are the qualities that make an air gun desirable and the reason Beeman air guns continue to be a favorite worldwide. 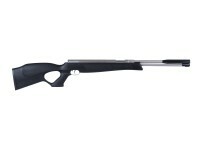 Your air rifle was shot before it left the factory to ensure it meets the company's high standards. Things I liked: Very high quality, in appearance, in construction, in the cocking, firing and accuracy!! Feels great in your hands and the trigger is smoooooooth!! Sharp looking... an absolute blast to shoot!! Things I would have changed: Nothing... I think it is the best springer on the market! High end, great build, accurate, accurate, accurate!!! Things I liked: Accurate, rust free, accurate, powerful enough, tanklike construction. I shot a quarter from 15 meters. It bent it in amazing fashion. This thing is powerful. What others should know: I don't think you'll be disappointed. Try different pellets. The right pellets make this a one-hole shooter. Things I would have changed: Be mindful of scope length with regard to covering the breech opening. Can make it a bit awkward to load pellet.This gun as with many lever guns is pretty heavy, which is ok if you are shooting from a brace or rest, but pretty heavy for offhand shooting. wish you would offer a front sling tube adapter, as a sling makes it a better hunter. What others should know: Overall I love the gun and would recommend it, and I do enjoy shooting it. but it is a bit pricy. Can I get the nickel finish with the blue laminate stock? 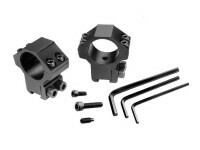 Will the included rings accommodate a scope with a 50mm objective? As long as they are high rings ? You will need the clearance to clear the barrel. Doesn't say? How quiet is it compared to the Gamo Whisperer do you think ? I have a gamo whisper fusion pro that is much louder than it should be. A Crosman fury making the same power is much quieter. It is very close in noise to the Gamo Whisper but it is much better built so it sounds more solid.